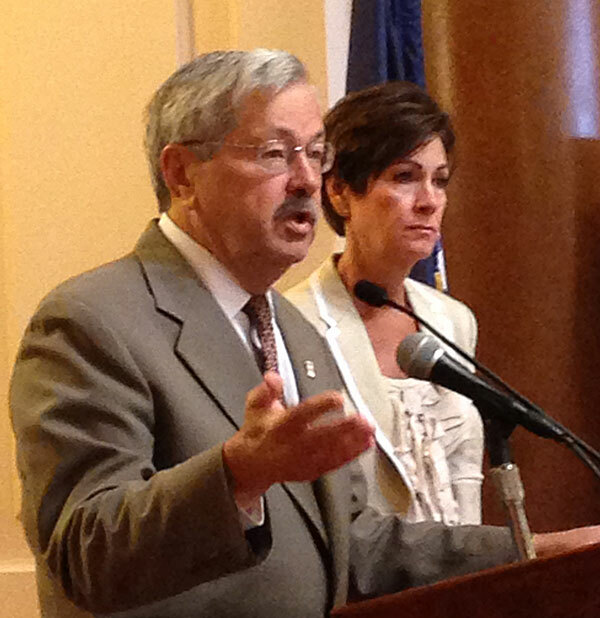 Governor Branstad and Lt. Governor Kim Reynolds. Governor Terry Branstad hasn’t yet decided whether to file an appeal to the rejection of his request for more federal help to deal with the bird flu outbreak. The U.S.D.A. already has committed half a billion dollars to deal with the outbreak, to cover the cost of the dead birds and the costs of disposal and cleaning up the barns, but the governor asked the Federal Emergency Management Agency to secure a presidential disaster declaration for the four counties hardest hit by the bird flu. Branstad, for example, wants additional federal unemployment benefits for those who’ve lost their jobs and their businesses. Thirty-two million chickens and turkeys were killed in Iowa due to the bird flu epidemic. Seventy-five different poultry operations in the state were hit and Branstad estimates at least 1500 people have lost their jobs.